By Aaron Sharockman on Thursday, November 16th, 2017 at 10:16 a.m. Think you can tell the difference between True and False? Do you really know what is fake news? 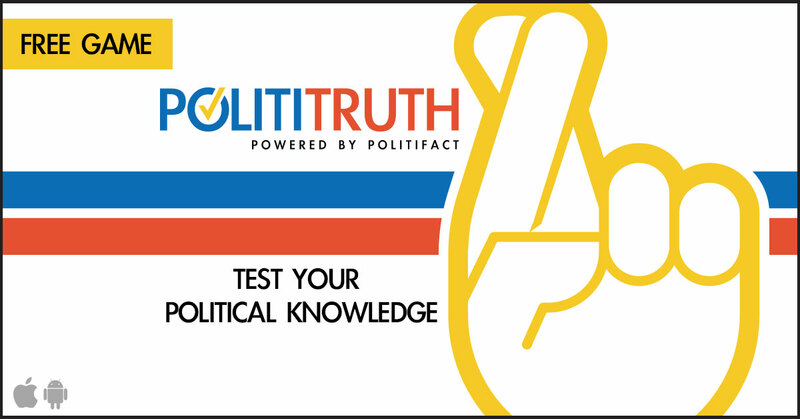 Now you can test yourself, and see how you stack up against everyone else, with our new game PolitiTruth. PolitiTruth is a mobile app available for Iphone and Android that lets you see the statements we at PolitiFact fact-check and let you in on the action. Swipe right for False, left for True. But trust me, sorting out fact from fiction isn't as easy as it seems. We're rolling this new app out to our Truth Squad members first, and we want to hear what you think about it. Email us at [email protected] with your thoughts. The game is available for free download for iOS and Android. After every five games you play, you'll see how you stack up against other players, discover players' misconceptions and learn if you're improving or (gasp!) regressing. The game allows you access to our database of nearly 14,000 fact-checks, so if there's any quote you're not sure of, you can read all about the facts behind it. PolitiFact only uses on-the-record sources, and we post links to every piece of information we use in determining our rating. So, take on your friends and see who has the best handle on the facts. Just promise me one thing: If you win, don't call them fake news. The PolitiTruth game is available for free download for iOS and Android.